The issue of Illegal, Unreported and Unregulated (IUU) fishing in world fisheries is of serious concern. IUU fishing undermines efforts to conserve and mange fish stocks in all capture fisheries. The Ministry of Commerce & Industry vide notification No.2/97/2009-EI&EP dt. 11.12.2009 has notified MPEDA as the nodal agency to validate the catch certificate for the export of seafood to EU countries in accordance with the EU Regulation 1005/2008 which has been designated to prevent, deter and eliminate Illegal, Unreported and Unregulated (IUU) fishing. Catch certification is an integral part of the IUU Regulation which will facilitate traceability of all fishery products traded within EU countries. Catch certification regime started from 1st January 2010 and as on March 2014, we have validated 38174 catch certificates for the exports to EU through our field offices located at all maritime states. 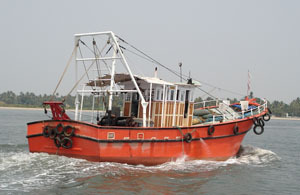 Conducted by fishing vessels in violation of national laws or international obligation, including those undertaken by cooperating states to a relevant regional fisheries management organization. Which have been undertaken in the area of competence of a relevant regional fisheries management organization and have not been reported, or have been misreported in contravention of the reporting procedures of that organization. Conducted in areas or for fish stocks in relation to which there are no applicable conservation or management measures by fishing vessels in a manner that is not consistent with state responsibilities for the conservation of living marine resources under international law.